Webster’s was one of the highest selling bitter brands in Britain by the end of the 1980s. The Fountain Head Brewery was founded in 1830 by John Mitchell in Ovenden, a small village just outside Halifax, West Yorkshire. Samuel Webster (1813-1872) took over the lease in 1838, aided by money lent by his uncle, Isaac Green. The annual rent was £100 (around £10,000 today). After one year, he obtained a 21 year lease on the brewery. In 1845, Webster bought his first pub, the Lane Ends in nearby Wheatley. Webster had been raised as a Congregationalist, but as the faith frowned upon alcohol he switched his allegiance to the Church of England. In 1851, Webster bought the brewery and a 26 acre farm for £2,500 (around £300,000 today). The first recorded use of the Fountain Head brewery name was also that year. By 1860, Webster’s three eldest sons, Isaac, George Henry and Samuel Green, had been admitted into the business as partners, and the company began trading as Samuel Webster & Sons. The brewery was valued in 1871 at between £18,000 and £20,000 (around £2 million today). By this time it was producing around 400 barrels a week and employed 17 men. The company had around a dozen tied houses and a substantial free trade. Samuel Webster died in 1872. He had no public career, and his life was dedicated to his business. As such, he received no obituary in any of the local newspapers of the day. The brewery was rebuilt between 1872-3. At least 49 houses were acquired between 1872 and 1878. Webster’s became an incorporated company in 1890, with a valuation of £300,000 (equivalent to £33.6 million today). By this time it had an estate of 108 tied houses. By 1895 Webster’s had the largest number of houses in the Halifax area with 74, compared to 56 for Joseph Stocks and 55 for Thomas Ramsden. The company’s flagship beer, Green Label, was launched in 1928. A filtered, bottled beer, it was in the local “light mild” style. A surviving example of this style is Timothy Taylor’s Golden Best. Beers of the style are characterised by a golden colour and a relatively low ABV. In 1929, the company and its assets were valued at £468,833 (£26 million today). Accounting for inflation, the company was worth less than in 1890. This was because the temperance movement had gained significant traction in the Calderdale area, and the local authority would sometimes requisition pubs and close them down. Due to these difficult trading circumstances, Webster’s acquired the Halifax brewer Joseph Stocks in 1933 for £64,000. Stocks brought with it some 90 tied houses. By 1937, output was 40,000 barrels a year, with the brewery capable of supplying 1,000 barrels a week during busy periods such as Christmas and Easter. That year, the company ceased to use dray horses for deliveries, mainly due to the extremely hilly nature of the surrounding area. By 1960, the board of directors were concerned about the possibility of a takeover bid. To prevent against this, they invited the national brewer Watney Mann to take a 25 percent stake in the company. From this period, Webster’s brewed and sold Watney’s Red Barrel draught keg beer throughout their estate. Lager was introduced to the estate from 1962, following agreements with Ind Coope and Tuborg of Denmark. Local television advertising began in 1961, on Granada. Because of the popularity of its light mild, Webster’s had never needed to produce a bitter beer. However, as it began to expand outside of its traditional trading area, this gap in it portfolio became more apparent. In April 1961 the company launched Pennine Bitter. The company closed its maltings down in 1963, as it was able to buy malt externally at a lower price than it could produce for itself. In 1966 the company took over J Hey of Bradford and 73 houses for £1 million (£16.3 million today). By 1967, Webster’s had an estate of 320 tied houses and 12 off licenses, with a market capitalization of £6 million (£95 million today). In 1973 the company embarked on a £2 million expansion programme. New brewery buildings and plant cost £650,000, and a chilling and filtering department expansion cost £250,000. The refurbished brewery was built along the same lines as the J W Cameron brewery in Hartlepool. That same year, Watney Mann offered £18 million for the 73 percent of Webster’s that it did not already own. The idea was to make Webster’s a poison pill to make Watney too large for Grand Metropolitan to acquire. The takeover was friendly, with the approval of the Webster family, who still owned 20 percent of shares. Watney’s poison pill strategy was unsuccessful however, and it was itself acquired by Grand Met later that year. In 1978 a new lager plant was started, built for £4 million and capable of producing 9,600 barrels a week. Initially it brewed only Carlsberg, but later Budweiser and Foster’s. By the early 1980s, Webster’s had an annual production of around 400,000 barrels, and the brewery employed around 600 people. With Grand Met’s nationwide distribution, Webster’s turned into a national brand. In 1986, Grand Met closed down the Wilson brewery in Manchester and moved production to the Fountain Head brewery. In 1987, Fountain Head capacity was extended from 1 million to 1.3 million barrels a year. Grand Met divested its brewing assets in 1990, and Webster’s became part of Courage. By that year Webster’s had an annual revenue of around £100 million and claimed 7 per cent of the national bitter market. As Courage owned the similar and more popular John Smith’s ale brand, marketing of Webster’s was de-prioritised. In 1990, Smith’s was ranked fourth in the bitter market, while Webster’s was sixth. 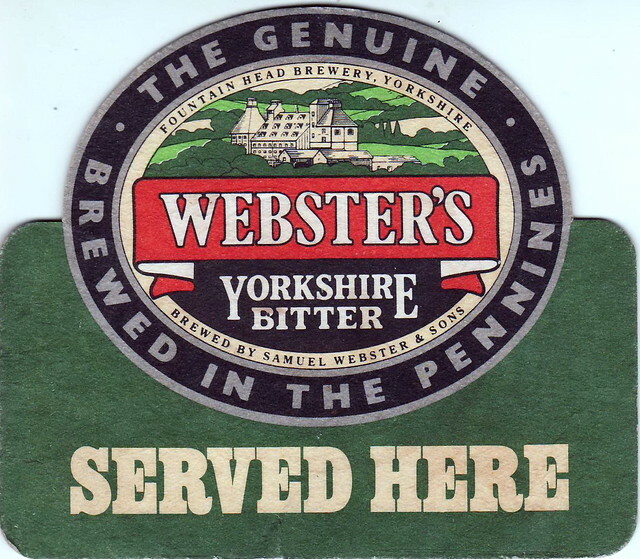 After Scottish & Newcastle acquired Courage in 1995, Webster’s was further sidelined as S&N also owned a third Yorkshire ale brand in Theakston’s. By 1996, three times more John Smith’s was being sold than Webster’s. By 1996, the Fountain Head brewery was operating at less than 50 percent capacity. It was closed in November of that year, with the loss of 186 jobs. Webster’s production was moved to John Smith’s in Tadcaster. In 2004, S&N sold the company to Silvan Brands, who moved production to Thomas Hardy in Burtonwood. Decline continued: sales fell from 80,000 to 40,000 barrels between 2001 and 2007. Cask conditioned production ceased in 2010. Remarkably, as of 2018, Webster’s Yorkshire Bitter is still hanging on as a keg bitter brand. Webster’s Green Label appears to have been discontinued around 2014.